LOS ANGELES — The first time I watched Damien Chazelle’s musical, “La La Land,” I thought a lot about how it worked, about its form, his craft and how the lickable candy-colored costumes bring to mind both M&M’s and Jacques Demy. I thought about how Mr. Chazelle and his stars, Emma Stone and Ryan Gosling, fit into the history of the film musical. When I went to see “La La Land” again, I was in a terrible state, and this time I just fell into it, gratefully. I surrendered. Afterward, I realized that this must have been what it was like to watch Fred Astaire and Ginger Rogers during the Great Depression. In “La La Land,” Mr. Chazelle has a shot at something that has eluded auteurist titans like Peter Bogdanovich and Francis Ford Coppola: to make musicals matter again. For decades, the genre that helped Hollywood’s golden age glitter has sputtered, resurfacing in Broadway adaptations like “Into the Woods” or sneaking in sideways in the “Magic Mike” movies, where the music is canned and the dancing grindingly dirty. About the only consistent sources for old-fashioned singing and dancing of the Turner Classic Movies kind has been Disney cartoons, television shows like “Glee” and TCM itself. Musicals have been for kids, for knowing winks and nostalgia. A musical with big numbers, intimate reveries and adult feelings, “La La Land” is a boy-meets-girl tale with early 21st-century rhythms (mostly good, even if its white stars are nestled, more self-consciously than naturally, in a multicultural world). It grapples with love between equals in a story about an aspiring actress, Mia (Ms. Stone), who meets an ambitious musician, Sebastian (Mr. Gosling), Los Angeles-style during a traffic jam on a freeway: He honks his horn at her; she flips him the bird. It takes a while for them to get together — they meet, they retreat, repeat — only to end up swaying in that fading, soft-light time known as the magic hour, tapping and twirling yet never quite touching. 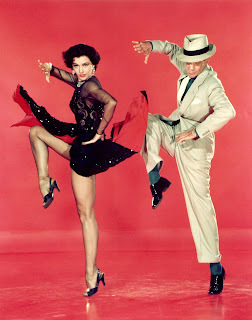 After another encounter, they at last move as one — s’wonderful, as Astaire crooned. Contemporary American movies could use more s’wonderful, more music and dance, and way, way more surrealism. They’re too dull, too ordinary and too straight, whether they’re mired in superhero clichés or remodeled kitchen-sink realism. One of the transformative pleasures of musicals is that even at their most choreographed, they break from conformity, the dos and don’ts of a regimented life, suggesting the possibility that everyone can move to her own beat. It’s enormously pleasurable when an evening stroll turns into a rhythmic saunter and then bursts into dance — think of Gene Kelly walking, tapping, stomping and exulting in the rain. At Harvard, Mr. Chazelle nurtured his love for musicals — he became obsessed with Gene Kelly and Stanley Donen’s “It’s Always Fair Weather,” a musical about loss, disappointment and masculinity — and started on his senior thesis film, which became his feature directorial debut, “Guy and Madeline on a Park Bench.” That film grew out of a discussion he had with another student, Justin Hurwitz — they were in a rock band together — and “me just asking him, ‘Hey, if I did something that was either a musical or kind of a musical that I needed original music for, would you do the music?’” Mr. Hurwitz did, going on to compose for “La La Land” and “Whiplash,” Mr. Chazelle’s second feature. A near-musical, “Guy and Madeline” centers on a young jazzman and a free spirit who split after it opens, only to reunite later (perhaps). The film’s textures, jazz and bohemian milieu as well as its black-and-white visuals evoke the young John Cassavetes, while its playful embrace of the musical suggests the scene in Mr. Godard’s “Band of Outsiders” when three characters line dance in a cafe. (“Parenthetically,” Mr. Godard says, “now’s the time to describe their feelings.”) “I sort of thought of ‘Guy and Madeline’ as not a full musical,” Mr. Chazelle said, “but a movie that kind of becomes a musical.” Part of its charm is that — as he plays, and as she sings and dances — Guy and Madeline become themselves. The shifts in “Guy and Madeline” from the everyday to its tapping, tuneful numbers is characteristic of musicals that blend the walking-and-talking ordinary world with the singing-and-dancing musical world. 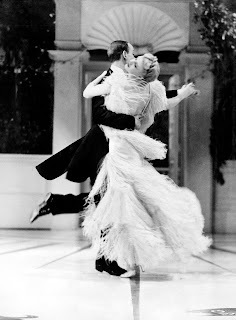 In “Top Hat,” Astaire and Rogers start dancing in a gazebo during a storm almost by chance. She’s dressed in a riding outfit while he’s in a jacket and tie, which underscores the ordinariness of their being together until, that is, he starts singing “Isn’t This a Lovely Day (to Be Caught in the Rain).” In the backstage musical, the numbers tend to be set off from offstage life (as in Busby Berkeley 1930s fantasias); a lot of musicals, including “Singin’ in the Rain,” combine these approaches. “La La Land,” which opens Dec. 9, integrates its numbers, even the most fantastical, as if it were the most natural thing in the world for a guy to tap-dance on a park bench or a woman to dream herself into a waltz. Mia and Sebastian meet early but don’t connect until they bump into each other at a party. Later, while walking to her car, they end up in Griffith Park, a swath of Los Angeles that, like everything in the city, is part of movie history. (“A rock is a rock, and a tree is a tree. Shoot it in Griffith Park!” is an old industry maxim.) As the sky glows pink, Mia sits on a bench to change out of her heels. All at once, they’re both wearing spectator shoes and, as suddenly, they’re side by side. Their feet start moving together, and the rest follows. In October 2015, I watched Mr. Chazelle shoot several numbers for “La La Land” at the Hollywood Center Studios, the same lot where Astaire made “Second Chorus” and Mr. Coppola started going broke making “One From the Heart.” Throughout “La La Land,” Mr. Chazelle plays with realism, moving from the recognizable now into full-blown fantasy, as when Mia and Sebastian walk into one of those sets that turn reality into an Impressionistic backdrop, in this case a city that’s distilled into the “Hollywood” sign and the Watts Towers. It’s a tricky scene that requires Ms. Stone and Mr. Gosling to enter a vibrant throng of dancing extras before they part ways. On both days, Mr. Chazelle used an enormous crane with a telescoping column — the camera was at one end, the operator at the other — which allowed a wide range of fluid motion and high angles like those that punctuate “Singin’ in the Rain.” (“We needed that lift at the end,” Mr. Chazelle said later.) His mantra that day and the next was “It’s got to be head to toe,” a refrain that would have pleased Astaire, who liked to show the body fully in frame. Astaire disliked the fragmentation of Berkeley’s numbers, which could turn bodies into machinelike parts, insisting that “either the camera will dance or I will.” Of course, in great musicals it’s always a duet. With the choreographer Mandy Moore, Mr. Chazelle worked with what Mr. Gosling and Ms. Stone brought with them. He also showed them favorites like “The Band Wagon” and Demy’s “The Umbrellas of Cherbourg.” Together they tried to find “the little weird idiosyncrasies” of their characters’ body language, Mr. Chazelle said, “and then build numbers out of that.” Mr. Gosling was a child performer (“The All New Mickey Mouse Club”) and has a dancer’s posture and silky walk; Ms. Stone starred in the recent Broadway revival of “Cabaret.” Each dances and sings well enough to put the numbers in “La La” across, even as their wobble and strain keep them down to earth. There are various reasons the American film musical fell out of favor, including the transformation of the old studio system and changing audience tastes, behaviors and more. We stopped dancing, except at clubs and parties; the film musical grew grim and then grimmer (“Cabaret,” “Saturday Night Fever”). Women’s liberation and changing gender relations confused Hollywood — and still do. The movie industry excels at recycling genres, stories and stereotypes, but it hasn’t been adept at making them work with emancipated women, who no longer need men to have their happily ever after. “I find it wonderful that in the same era in Hollywood as screwball comedies,” Mr. Chazelle said, “where everything was about this patter and conversations building to certain catharsis with a couple — that this series of musicals was able to do its version of that, but without any words at all and just with dancing.” For him, the only recent film that suggests such catharsis is “Pulp Fiction” — John Travolta and Uma Thurman dancing is the closest to Fred and Ginger that we’ve gotten. Of course, Fred never had to revive Ginger by plunging a hypodermic into her heart after a drug overdose, a scene that suggests why it’s hard for American cinema to again embrace the musical, even as the likes of “Pitch Perfect” and the cheerleading series “Bring It On” flirt with the genre. Musicals are for idealists. One of the pleasures of classic film musicals is the chance to watch bodies become extraordinary — strolling and then singing and soaring — often in stories that suggest that with some choir practice and maybe an Arthur Murray dance lesson or two, you could soar, too. Musicals are liberation with a beat. When Judy Garland sang “Over the Rainbow,” she was telling her audience that it would transcend its terrible times. (No wonder gay men embraced her.) When the Nicholas Brothers danced in “Stormy Weather,” they offered a profound vision of the United States that few old Hollywood movies did: two brilliant black men who, despite the racial inequities of their country, could embody the sublime better than anyone else could. Still, I wonder if the gulf between a film like “Top Hat” and, say, “Pulp Fiction” is too vast to bridge for contemporary moviegoers, who might be too knowing, cynical, segmented or self-absorbed to be transported by — and believe in — two people who spontaneously sing and dance as one. (Among the more familiar dance images of the last decade are the Apple ads with silhouettes dancing alone to their iPods.) I hope not. Because while “La La Land” engages with nostalgia, it also passionately speaks to the present just by asking whether it’s possible (finally) for a romantically involved woman and man to get past the struggle part of the struggle for reciprocity, to borrow Mr. Cavell’s language. We know men and women can go toe to toe, but can they still dance cheek to cheek?